Five years ago I went to my first ever Big Day Out. It was a 40th birthday present from my then-17 year old son. We had recently all acquired nanos, courtesy of the Rudd government stimulus package. The offspring loaded mine with music he thought I might like, based on the unfortunate happenstance of coming of age in the 80s. I fell in love with Muse and MCR. He remarked that I have the musical taste of a 15 year old girl. Anyway, Muse were headlining and there I was with three teen boys – all with lily white skin – and a backpack filled with lychees and olives and sunscreen and a small lunchbox for ice cube refills. The boys were just shy of their 18th birthdays. I made them put on sunscreen in return for beer. After that, I went back each year. Last year we went with my daughter. At 15 she was old enough for her first big music festival. That first BDO was a culture shock. I saw aggressive racism from white men that was overt and overtly ugly. At the time, racist attacks on Indian students were being reported – and the racist component of those attacks largely denied by our political leadership. As Kevin Dunn (2010) wryly notes, a majority of Australians agree that racism exists in Australia, while 100% of Australian politicians say that it does not. Around mid-afternoon, in other words in broad daylight, I was walking behind three shirtless young white men draped in our flag and swearing in broad Australian accents. We were at the food court. The food court is a strip of caterers selling meals from all over the world. Both they and I stopped at the dumpling bar. The white men started raving at the proprietor to go back to his own country. They pulled at their own eyes and affected fake accents to use a range of abusive racist slurs that I have not heard since the 1970s. Back then the words were used more casually than abusively – which is still racist, but marginally less threatening. As the other two helped themselves to wantons, one of the men leaned in and scooped up fried rice from the bain marie with his bare, filthy hands, tipped his head back, and poured the rice into his boozy gob. This gross spectacle, of white men behaving violently while asserting cultural superiority – over a man who had clearly laboured night and day to prepare beautiful delicate food – lasted several long minutes. I moved into the space to be served, and to distract the bigots. They ended their attack with the c-word. I told the closest man to stop speaking like that. Just in my mum-voice: ‘stop speaking like that’. He looked surprised, apologised, and said he was not talking to me. ‘Not you’, he said, like he was the politest guy any mum could meet. I said I don’t care who you’re talking to and moved to place my order. The men moved on. I paid for my dumplings and followed them around at a distance for a while. There were no police or security nearby. I gave up and went back to the main stage. It is not unusual to observe white men being obscene while asserting that some other group is inferior to them. We heard it this week with Tony Abbott blathering about the superiority of western culture. I have written long and often about Western civilisation, a force of despicable destruction of people and the planet. We also harm our own, having produced a generation more likely to be diagnosed with obesity, diabetes and depression than any other maladies. This is not success. Later that afternoon I saw a micro-version of the same event. A shirtless young white guy walked up to a drinks wagon, shoulder-shoved the vendor, and dived his hand into the cart, helping himself to several bottles of iced tea. He chucked some ice in the vendor’s face and walked off. When I relayed these stories, the response from white Australians was nonchalance and denial. Where was security? Was a common question. Security? What about human decency? At least, unlike with crimes against women, people did not blame the vendors. Yet responsibility quite obviously lies with the violent men; and this was simply not voiced. This is the Australia we live in; a place where white men who are violent are rarely called to account, and are invariably given the benefit of the doubt. Responsibility for their violence is shifted sideways onto someone else including onto people who were not there, by people who were not there. I decided to have a look at the wider culture, a culture that supports and fails to condemn the sorts of actions described here. The data set I chose was comments from web pages about BDO and the flag. 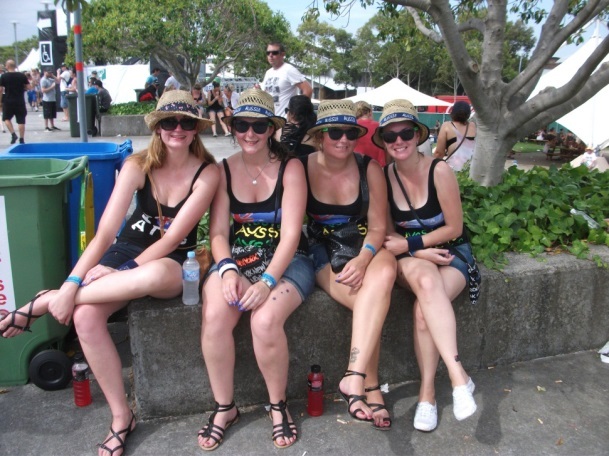 The traditional date for BDO Sydney was, for years, the 26 January long weekend. But in December 2005, several large groups of white men violently attacked people of colour in the southern Sydney beach suburb of Cronulla. In January 2006, BDO was a site of ongoing racist violence, including reports of white men demanding people of colour ‘kiss the flag’. The following year, because of these people, organisers asked festival goers to leave their flags at home. A simple request, easily honoured. Naturally, therefore, the tabloids went nuts. Politicians rushed out solemn statements on rights and flags. The rights of white Australians were, as ever, prioritised and aggressively promoted by white Australians in positions of power: politics, corporations, mass media. The right to not be harassed and assaulted took second place to this jingoistic pandering. It is my observation that the proliferation of Southern Cross tattoos can be traced to this time. 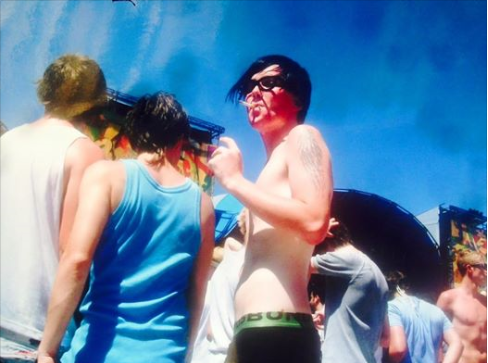 After all, if your Australian flag is on your skin, you can’t leave it at home, right? That’ll show those Muslims. Or festival organisers. Or someone. Something. A photo I took with permission ‘for cultural research’ of a festival goer in 2011; the tabloid response to requests to leave the flag at home. The Daily Telegraph poll hardly bears examination. It is self-selecting, as are the data discussed below; but the Tele poll is also pre-empted by the headline, while the Fairfax data are not. What do you think of the flag controversy? Is the Australian flag a provocative symbol – akin to ‘gang colours’ – as organisers of the Big Day Out suggest? Or is it a unifying symbol? 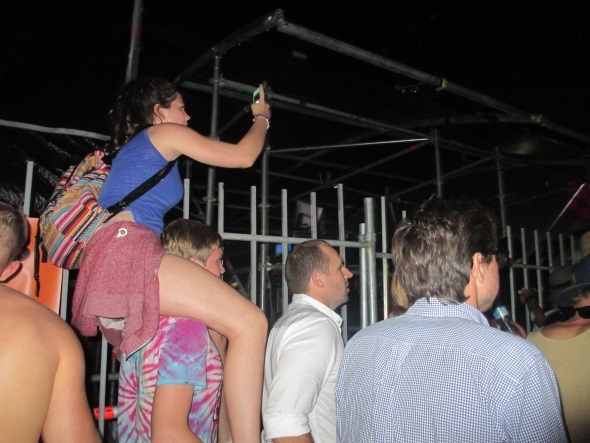 What do you think of the decision to discourage people from taking it to the concert? Central to the digitally-generated semantic map is Cronulla. The suburb name is in the intersection between two theme circles labelled racist and flag. The word riots did not appear – which I suspect it would today. Everyone is referring to yesterday’s anniversary as ten years since the Cronulla riots. Closer analysis revealed why: the word Cronulla itself had become shorthand for ‘racist riot’, as in ‘we don’t want another Cronulla’ (Sydney) or ‘we don’t want a Cronulla here’ (Melbourne). A few years earlier a friends’ daughter, who is a young Koori woman, had asked me if Southern Cross tattoos are white supremacist. Her question prompted me to subsequently ask men with Southern Cross tattoos – a tow truck driver, the pizza delivery guy, strangers at BDO – what their tattoo means. Each man replied with some variation of the phrase ‘Aussie pride’. The link between white supremacy and ‘Aussie pride’ can be seen in the semantic map. The word racism is more closely associated with Australia and Australians than any other concept. Nearby, racist gets its own theme circle. In the same circle is the word patriotism. The map works on co-occurrence. It is more than a word frequency count. It is a visual representation of which words travel together most closely, to each other, most often. The highest ranking results then become the label on the theme circle. 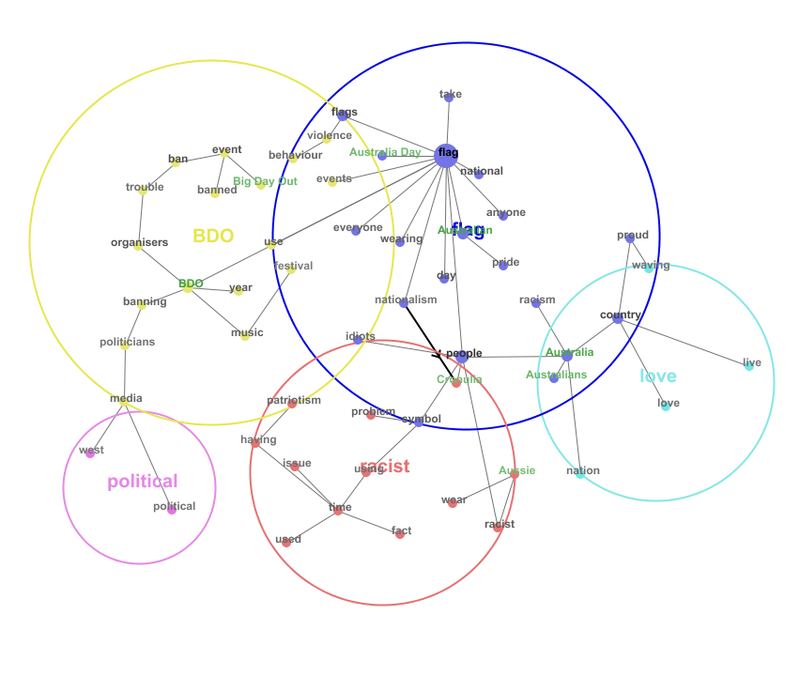 The map is showing that more concepts (the dots) are more closely and frequently associated with BDO, flag, and racist than other words (the theme circles usually reflect the question. If not, the researcher should check whether, or how, the data wandered off topic). So while the men I asked about their Southern Cross tattoos (which in turn either symbolises or forms part of an Australian flag) said ‘Aussie pride’, the Fairfax readers closely linked the concept of racism to Australian and racist to patriotism – all wrapped around by the dominant theme: flag. Not all semantic maps mirror life quite so closely: racists claiming patriotism, being dominating, while wrapped in the Australian flag. Again, this is only a representation of what interested Fairfax readers wrote online, but it is not a small sample. In the view of this self-selecting cohort, the problem with the Australian flag at BDO is racist patriotism. Predictably, Prime Minister (Howard), Opposition leader (Rudd), and Premier (Iemma) all weighed in, against the organisers and for the flag. Of course for these political leaders, the issue was not racists flaunting the flag but their freedom to do so. This also reflects what Dunn (2010) has found and what most Australians know: that there is racism in our communities; and that the political leadership deny (obfuscate, minimalize, distract from) its existence. One reason for political denialism around racism is that politicians facilitate racism. Unfortunately, some people fail to see that this is John Howard’s Australia, where racism is allowed, as long as you disguise it as patriotism. While I agree with this sentiment, I disagree that the situation is some kind of random misfortune. The media coverage, politicians’ statements and informal conversations all pointed to historical, structural, and continuously reproduced racist patriotism with harmful consequences and without negative consequences for the perpetrators. 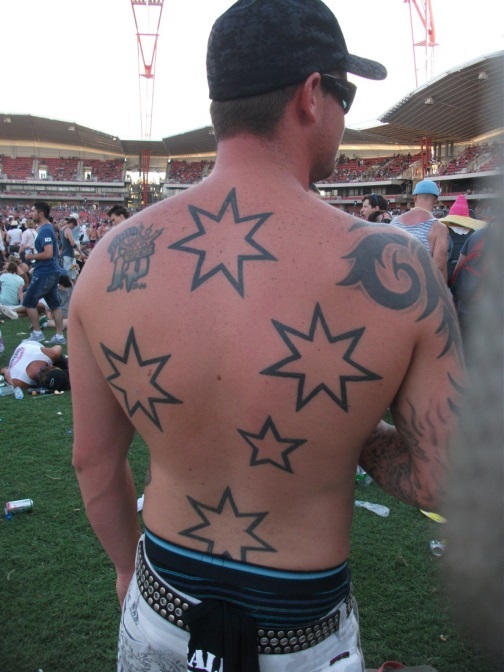 It may seem a long bow to join these dots from racist patriotism, the Australian flag and Southern Cross tattoos, to a white supremacist outlook, or ideology. More factors must also be present, and shown, such as hate based on race. A key indicator of such hate is violence perpetrated by white people against non-white people, with racist intent, or on the basis of race. According to the Fairfax commenters, this factor was also present. There were multiple accounts of the flag-kissing story in the comment thread: ‘I was at BDO last year and idiots wearing flags were making people kiss it and punching them if they didn’t.’ Is this eye-witness verification? The answer depends on to what degree we suspect (or know) that people, with the option of anonymity, make up claims on online forums. The answer is yes of course some people do, and some forums are more likely to attract rubbish claims. But the claims can also be matched to observations and experience: of Fairfax forums, of the way white men wearing flags (and others) behave at BDO. Either way, demanding that a person kiss the flag is trespass to the person and threat to assault. Given the demographics of the parties, it is almost certainly also in breach of s. 18C of the Racial Discrimination Act 1975 (Cth). That’s the section that makes unlawful an act that is ‘reasonably likely, in all the circumstances, to offend, insult, humiliate or intimidate’ a person or group on the basis of race. Punching anyone of any race is assault. I can’t help wondering how many men were held legally or socially to account for kiss-the-flag humiliation, intimidation or assault. Probably, like the events I witnessed, nobody was held to account in any way. In my view, such inaction – along with the tabloid headlines and tacit consent by the political leadership to obscure violence behind the flag – actually facilitates this specific kind of violence. Other eyewitnesses observed that ‘love of country’ was used by those ‘idiots wearing flags’ to be violent and to excuse violence. There is a case to be made that patriotism is itself innately violent. Patriotism is certainly mobilised around violent actions, like war. It is toxic masculinity at its worst. From declarations of war to war crimes, from group threats and assaults at BDO to racist violence at Cronulla, these scenes are initiated and enacted by men. Jingoism, however, was not confined to young men, only the incidents of violence. 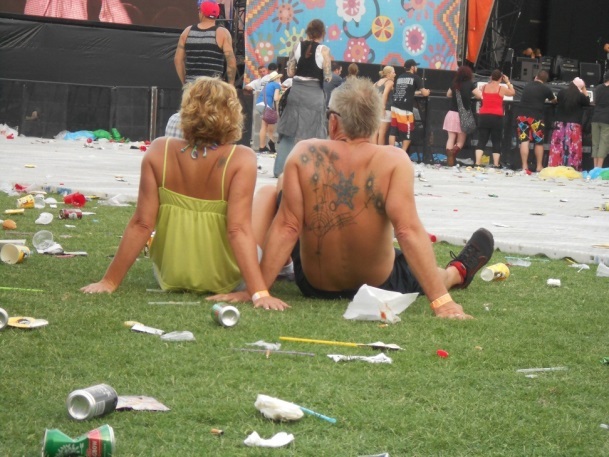 Festival-goers dressed in matching ‘heart Aussie’ tees with temporary southern cross tattoos, an older man with permanent Southern cross tattoo – taken with permission. There is one more theme from the Fairfax comment threads I want to look at, particularly since one of the first reported arrests today was of an older man wearing an Aboriginal flag tee shirt. Of course which organiser would have the balls to say that no Aboriginal can bring an Aboriginal flag alongside saying no one can bring an Australian flag. This comes from the ‘special treatment’ handbook of racist ideas. It assumes that authorities are intimidated by Aboriginal people when in fact authorities are extremely racist and violent and oppressive towards Aboriginal people. There is a persistent view that Aboriginal people enjoy special rights – rights that white Australians do not hold. This false conclusion is signalled in this comment. 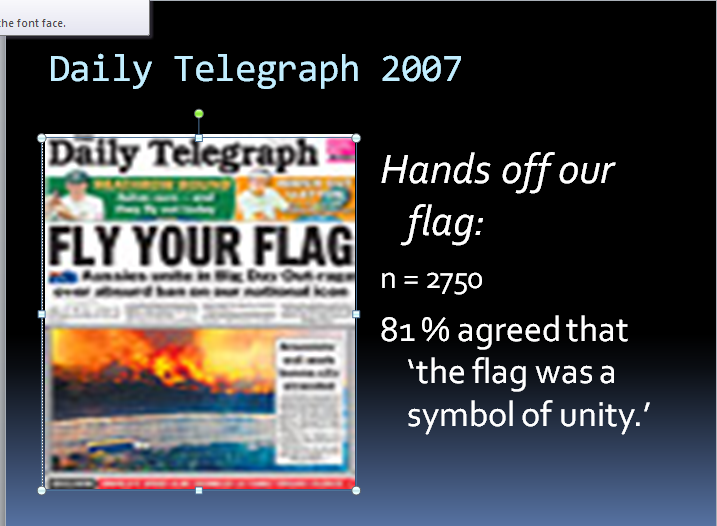 The author implies that Aboriginal people may be able to bring their flag while others can not. This is racist nonsense on several levels. Firstly, no-one was stopped or “banned” from taking the Australian flag anywhere. People were asked to leave their flags at home, due to racist violence disguised as patriotism. Many chose instead to bring more flags. More relevantly, Aboriginal people do not wrap themselves in their flag and go on violent drunken rampages, or persecute people of this or that ethnic or religious group. This simply does not happen. At the time, there would have been fresher memories of the 2004 civil unrest in Redfern. Those events were sparked by the police yet again causing the death of an Aboriginal person and being exonerated by the state. A community in deep pain, expressing anger at loss and state-sanctioned racist violence, is not comparable to a group of drunken white guys targetting people of colour with threats and assault. There is only one commonality here, and that is white men perpetuating structural violence based on race. This commonality is conflated using false equivalence, via those casually enabling responses I mentioned above: where white men are being violently racist, we shift their responsibility sideways, whether on to victim-survivors (Aboriginal people, women, children) or onto some vague general non-presence (where was security?). Even the more informed comments about BDO and flags carried a vague idea of Aboriginal First Peoples somehow denying mainstream – white – rights. Unless you are Aboriginal, we have all come from somewhere outside Australia. The notion that this should be banned is disgraceful, embarrassing, ignorant, and downright pathetic. We have seen far more debate and precious little progress since then. Adam Goodes is booed for displaying his culture. Justice for Miss Dhu remains out of reach. In the Northern Territory police enthusiastically exercise paperless arrest powers while knowing for a fact that it will directly cause more deaths of Aboriginal people in custody. Violence is no less violent when wrapped in a piece of cloth. The analysis here strongly indicates that racism is exacerbated by overt patriotism, as symbolised by the flag. By the same dynamic, patriotism is used to simultaneously mobilise and excuse violence. It does not have to be this way. 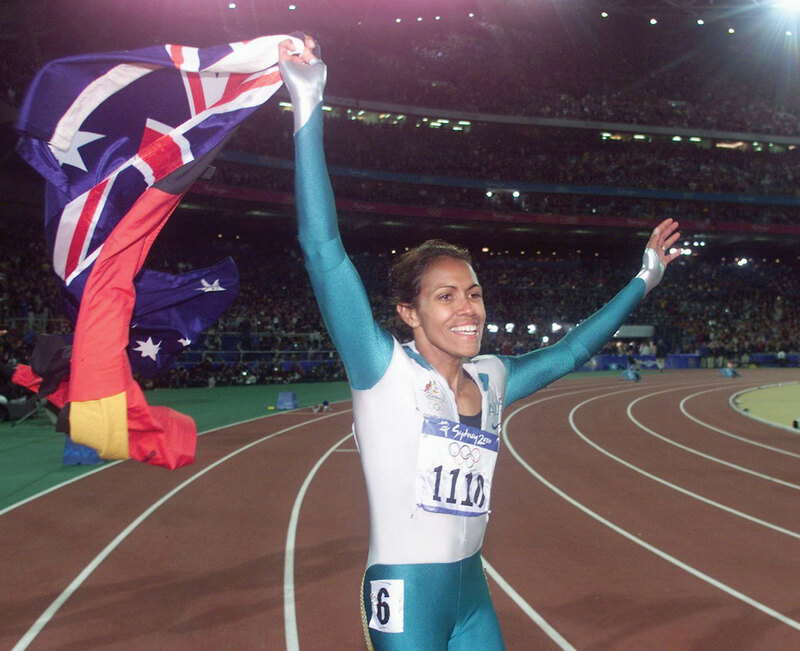 Remember Cathy Freeman, effortlessly embracing her identity? She was criticised for this gesture of reconciliation too. What does it tell us that even Cathy Freeman, holding two flags aloft after winning Olympic gold on home soil, is perceived as threatening to a certain kind of white Australian? If anyone holds deep knowledge of surviving violence and adapting to multiculturalism, it is Aboriginal Australia. Now the reason why I think of my Grandfather, and I would really like your thoughts Ingrid, is that he was in both world war II and worked the rest of his life on the Railways in Qld, so you could say he knew a bit about ‘groups of blokes’ LOL! Anyhow, his theory was that guys went feral in gangs due to a feeling of inadequacy. As in, they were not really racist as such, more lazy and picking the colour of someone’s skin was just about the laziest way to make a point of difference and as he used to say, the only way bullies can feel good about themselves is if they denigrate someone else? His theory was that is was weaker men who banded together to find a weaker prey to buff themselves up. He also felt that it was something that men in this nation seemed to be attracted to (and that conversation piece seems to back him up) and he wondered if it was because so many Australians were mongrels with absolutely no idea where they came from that due to not having a ‘heritage’ as such to fall back on and feel they belonged to, they instead formed groups that compensated to make them feel they belonged somewhere? I tend to agree with your grand dad. I also think the stronger, more sensible men prefer to spend free time with a functioning home and family than in large groups of men. I guess there’s two strands I’d be interested in (a) why does society as a whole nevertheless allow white men specifically – as an identifiable group – to act in racist violent ways more or less with impunity (b) could the strong guys like grand dad with credentials (eg WWII) that make them credible to the racist idiots not do more to counter that garbage like we saw at Cronulla yesterday? Some vets could speak out. Like how bout our Cap’n Hastie condemn Islamaphobia, y’know? Exactly. Maybe I didn’t explain well enough. But he tended to think it was not the ‘racism’ that caused rioting (again, remember he is talking fracas in small towns) but that ‘racism’ was the ‘excuse’ used for men to be in a group/gang to try to ‘prove’ something to themselves? ie he mentioned a drama in Mt Isa back in the day and was mostly minors against the ‘extra workers’, ie bosses, accountants, even builders employed as for some reason many seemed more white collar than the miners – even though the builders etc were paid less than miners, anyhow… – and it turned into an alcohol fueled gang fight. Which, was pretty similar to the one the year before against the Aboriginals. As in same suspects involved in the gang. So his attitude was that some men – for some reason usually men – needed to find a common fault in another ‘group’ to bind themselves into a gang to find some worth. When maybe it is due to our heritage of mongrels that men in particular don’t actually feel they belong or don’t have an obvious thread to belong to, so pretty much make up one and denigrate another group, to give them that belonging? There’s a couple of strands in that… First I often refer to myself when asked about my heritage as ‘the usual mongrel mix of 6th gen white Australian’ – which is English, Scots, Irish, Welsh, and Cornish (and the Cornish, just as much as Geordies, Lancashire and Yorkshire folk, asserted a separate identity to the English). And yes, I do think that white Aust people of my heritage/background feel displaced and lacking belonging. At the same time I think it is our duty to ourselves to seek and find that belonging rather than blame others or expect Aboriginal people to accommodate us and our lost soul narrative. We still benefit from the dispossession, whether we feel hard done by or lacking choice etc. I also agree that men seek that belonging in a common enemy, and that is an identifiably masculine behaviour. The problem of course comes ta the next step – men are more likely to look outward and then be violent when they are unhappy, lacking belonging or whatever. And men are told that the place to find that belonging is in a strong bread winning role or some other ‘winning’ role (sport, the military). A lot of men discover too late that the belonging they really rely on is within the home. The home or domestic sphere is traditionally where women have more power so that can be emasculating – for the wek man, to be associated with women’s roles or spaces is emasculating. Anyway, there is a lot in it, from Australian male identity to traditional roles that we are breaking down but slowly, too damn slowly! !